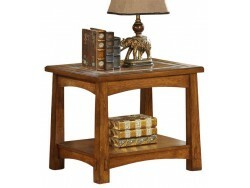 The Home Craftsman end table features a framed top with a slate tile border and a veneer panel insert and fixed bottom shelf. 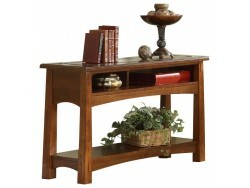 The table is constructed of hardwood solid and oak veneer with an Americana Oak finish. The Dunmore entertainment wall system is not only beautiful but also provides a place for all of your home entertainment electronics. 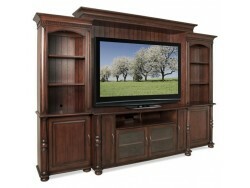 The unit also provides ample storage and display areas for your favorite treasures. The wall is constructed of poplar hardwood solid and cherry veneer with an upland cherry finish. Generously proportioned pieces resulting in ample seating space, tailored pad over arm pillow, padded reclining chaise topper, press-back stationary chaise, and the tailored picture frame back are just a few of the features making "Comfortscapes" a natural selection when demanding every-day- lived-in reclining comfort. Just take a seat and see how Vail moves you. Sit back and enjoy the soothing rocker motion and more relaxing options with PowerReclineXR, the new power option that lets you independently adjust the back and legrest at the touch of a button to any combination of positions for virtually endless relaxing possibilities. The Home Craftsman sofa table features a framed top with a slate tile border and a veneer panel insert and fixed bottom shelf. The table is constructed of hardwood solid and oak veneer with an Americana Oak finish. The Marston entertainment wall system is not only beautiful but also provides a place for all of your home entertainment electronics. 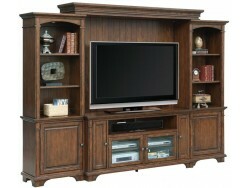 The unit also provides ample storage and display areas for your favorite treasures. The wall is constructed of constructed of ash hardwood solid and oak veneer with a Rutledge Burnished Oak finish. The Danville chair is perfect for your smaller apartment or condominium and a perfect compliment to the Danville sofa. 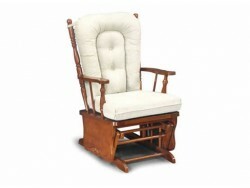 The classic traditional styling of this group will look great in almost any room. Choose from our large selection of fabrics for a customized look to fit your style. "Jitterbug's" sleek, contemporary lines will make your favorite room come alive with style. Sink into the comfort of padded headrests, cushy sloping arms and fully cushioned chaise-pad ottomans. The 1.8 density foam and amazing 28 pound compression will keep you comfortable for years. Big on comfort and on style, the Crandell rocker recliner's deep cushions and generous proportions are an invitation to kick back and relax. An extra-tall back and over-scaled seat provide the maximum in accommodating comfort. 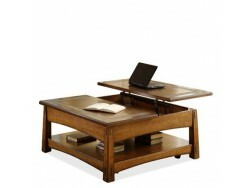 The Home Craftsman sofa table features a framed top with a slate tile border and a veneer panel insert. The top has a lift hinge which moves the front half of top panel up and forward creating a desk or place for food and drink. The table is constructed of hardwood solid and oak veneer with an Americana Oak finish. European scale and proportions make the MONACO stand out from the crowd. Notice how far the arms flair out from the body of the sofa. This design element is used again in the wings of the backs which help to give a completeness to the silhouette. Pad-over-chaise seating and poly-foam in the arm pads, help to ensure years of comfort to come. The Home Craftsman coffee table features a framed top with a slate tile border and a veneer panel insert and fixed bottom shelf. 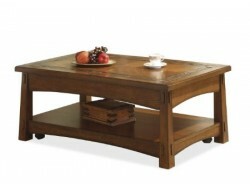 The table is constructed of hardwood solid and oak veneer with an Americana Oak finish.